No modding of an existing light. It Must be made from scratch. No pre-made heat sink, or flashlight head, body, tail cap, etc. Lights must be constructed out of at least 75% metal. The other 25% may be of some other material. Exceptions: You may use a pre-made switch, driver/contact board, spring, led, star, reflector, lens, “O” rings. EDIT: I will add a P60-Drop-in (bare/empty drop in), to the list of acceptable. It must be a hand held light, not stationary. It has to work and you must be able to show a beam shot of it working. In order to participate and be judged, you must be able to photograph the build as it progresses. Actually, that will help the judges determine how well you have made your light, so photos of the build, as it is being done, are mandatory. Use anything that can take clear and detailed photos for your build thread. No power tools. Nothing that is powered by AC or DC, such as a lathe, end mill, drill press, saw, sander, buffer, etc. No coatings that would need electricity, such as Anodizing, Plating, etc. Nothing sent to outside shops to have work done or coatings done. Painting with a spray can is allowed. Exceptions: An electric hand held drill or a Dremel/Rotary Tool. A soldering gun for soldering wires. No modding an existing light. It Must be made from scratch out of non-flashlight parts. No pre-made heat sink, or flashlight head, body, tail cap, etc. Lights must be constructed out of at least 25% metal. The other 75% may be of some other material. in each category, with an “Overall Best of Contest”. All Contestants: You must make your own build thread in the DIY Forum and PM me with the Link. I will Link ALL your threads in One Post here, where everyone can get to it easily. So make your thread when you are ready and PM me with the link. Wait till the contest starts before making your thread please. And another $50 to whoever is “Overall Best in Contest”. All builds and build threads must be completed by the end of the contest. No late entries. I think it would be good if you make your thread as you work on the light, to build a little suspense and give the judges more time to view your work. I just think it’s better to have the thread up there for members to see during the 3 weeks. There are several member judges for this contest. I am one and I will not be participating as a contestant. Once the Contest ends, the judges will have 3 days to select their choices for each category and for best of contest. I will notify the winners and post the results here. This is hopefully, the first of many Annual modding contests. If it goes over well, I hope to have other contests of this type. Above all, have fun with this. It’s just a way to let you get more involved in the forums and have some fun with flashlights. If for any reason the contributions become more than the initial prize values, I will add 2nd and 3rd place prizes and/or raise the prize amounts for the winners. 07-07-2013 I wanted to let you all know that Illumination Supply has just become a Sponsor in this Contest. The pot gets larger and now there will be a couple (or more), gift certificates going out to "runners up". 07-09-2013 We have another Sponsor for the Contest. LightsCastle is donating SIX $25 Gift Certificates. That means more prizes for more contestants! Yahoo! I am trying to keep track of a list of contestants and a link to their builds as they put them up. If you see I have not included you, or put you in the wrong category, let me know via PM and I will change it. This is awesome! I may not be able to start the build, but I can think about what to build. I would be interested in the hand-built category. Well guys, I hope you do decide to try it. When I say from scratch, think of "receptacles" that could already hold a led, heat sink, etc. A piece of pipe, a plastic coke bottle, a beer can, etc. Think about it and your inventiveness might make it an easy build and still be a fun build. Can't a P60 drop-in be put in just about anything? Remember, you can use a pre-made lens, reflector, led/star, switch, etc. I think a P60 drop-in would qualify, even though it kinda sorta has a heat sink I really would not call it a heat sink. Or a copper pipe cap would substitute for the P60 "heat sink". Anyway, I Hope you guys can be in it for sure. And another thing..... Remember I am not in the contest. I am the one setting it up, but I'm not in it. It's for y'all, not me, so jump in and take a chance. Ooh boy. This will convince me to start a build I’ve been thinking about for a while. Is butane powered torch (or similar) an acceptable tool for Hand-Made entries? No fair! 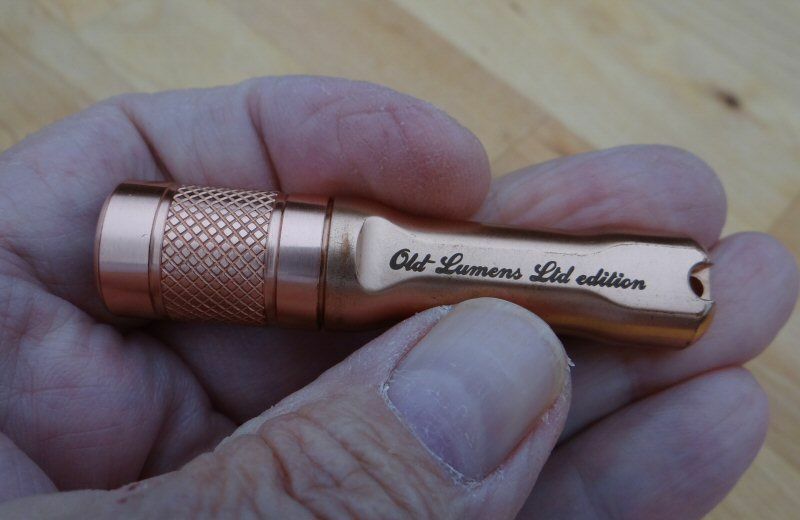 Old-Lumens (the king of customs) will win all the prizes for himself! Ooh boy. This will convince me to start a build I've been thinking about for a while. Is butane powered torch (or similar) an acceptable tool for Hand-Made entries? It sure should be. Glad to see you giving it a go. Nope, I'm not in the comp, just running the comp. It's for the rest of you. I will just enjoy getting to see all the cool builds. this will be so much fun I’ve been meaning to build a new headlamp for ages as my current one annoys be no end – would a headlamp count? It’ll be made from 1in.sq. tubing like all my scratch built lights, but it won’t be hand held (that’s the idea!). I really look forward to seeing the builds. I am extremely curious what great lights will come out of this. Thanks OL. Time to put the thinking cap on. Are we allowed to ask for ideas? Probably not so don’t answer that. I cant wait to see what some off the extremely capable and creative people here come up with. I know my main item will be a lot off scrap and my main design area will be filled with a lot off words that may be cursing. Where to start AA, 18650. 26650, gees i have a 16340 there I haven’t used yet. this will be so much fun I've been meaning to build a new headlamp for ages as my current one annoys be no end - would a headlamp count? It'll be made from 1in.sq. tubing like all my scratch built lights, but it won't be hand held (that's the idea!). How about portable? Hand held, head held , as long as it's meant for portability. Make sense? O.L. the Master Craftsman, will be a Judge. I can't wait to see some "Other" craftsmanship, but we ALL know we can't "Hold a candle Lumen" to O.L. If I find the time, its hand made of course. To any members here that want to join in the fun but maybe a little intimidated by the experienced modders and builders here I would suggest that the judges may take previous experience into consideration. Even if they dont this may be the perfect opportunity to jump in the deep end and have a go and maybe learn a little more. Personally nothing please’s me more than seeing someone post a new mod or build for the first or second time that they dont deem worthy but made the effort anyway to show us what they have achieved even sometimes with pictures that may not be that clear. So jump on board and help OL as he is helping us all. I have my general concept planned now. MRsDNF nailed it; a first effort is always interesting. I especially like seeing how someone overcomes say, a lack of certain tools or limited resources of some kind. The story matters too - having a son/daughter helper or incorporating some small aspect of your life makes it personal. When I first joined BLF, it was always fun for example, tuning in to whatever Don was doing and seeing The Assistant always nearby. One time, he simply emptied the contents of his backpack and we spent a week or two comparing the carry-junk we have in our man purses. I knew then, I was in the right place. To use a worn out phrase; it's not necessarily the destination, it's the journey. For recovery: pain killers(band aids), I see you have those listed. Warning, it is inadvisable to work with an open flame near alchohol above 100 proof. Well I hate to admit it, but I once build a light from galvanized pipe and a P60 dropin. It was so ugly that I dubbed it “the fuglight”. I should have taken pictures before throwing it in the garbage can. What a hideous obamanation. I’ll have to try some if the medicinal inspirational additives listed above before I break out the soldering iron again. Can I dowse a rag with xylene, toss it into a paper bag and use it as a creativity inducing inhalant? You know the original light built can only be improved on. Handmade and fugly is what y’all can expect to see from me. Thanks, O-L for thinking up this bit of awesomeness.